How wide is the divide between the hype and the research? Originally developed to treat severe epilepsy in infants and children under medical supervision, today the ketogenic diet is moving to the mainstream as a low-carbohydrate tool for weight loss and as a means to reduce cardiometabolic risk factors—but not without controversy. 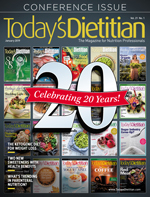 Today's Dietitian looks at what the ketogenic diet is, what's known about its risks and benefits, and whether patients who say they're "doing keto" are actually following a ketogenic diet. "Essentially, you are pushing carbs low enough that your body has no choice but to burn fat for fuel," says Andres Ayesta, MS, RD, LD, CSCS, CSSD, owner of Vive Nutrition in Orlando, Florida, adding that the true ketogenic diet can have a ratio of 75% to 90% calories from fat, 10% from protein, and 5% from carbs. "Sometimes in a clinical setting, not even vegetables are allowed." However, in research and in real life, diets labeled as "ketogenic" vary widely. "What most people are doing is a modified ketogenic diet or modified Atkins," Ayesta says. "It doesn't mean it's not effective, but it's not the same thing. Your ketone production may not be the same depending on how you're following the diet." "The thing that's really 'off' for me in terms of the mainstream discussion of this diet is that most people aren't really on a strict ketogenic diet, and there's no real definition or set levels outlined," says Diana Reid, MPH, RD, Luxembourg-based owner of The Global Dietitian. "Maybe someone is eating 10 g of carbs daily, maybe 25, 50, 80—it's all very inconsistent. And most people, while they're eating much fewer carbs and lots of fat, they're also eating a lot of protein, which can be converted to glucose. That sort of defeats the purpose of the diet." Why do ketogenic diets appear to have an advantage for weight loss—at least in the short term, since there are no long-term studies? There are several potential factors at play—including the fact that with any diet that restricts entire food groups, it's possible that reduced dietary variety leads to reduced calorie intake. "Ketogenic diets dramatically elevate fat burning, which results in a much more stable flow of energy to all organs and tissues, especially the brain," says Jeff Volek, PhD, RD, a professor in the department of human sciences at Ohio State University. "Cravings and hunger are dramatically reduced and people don't need to eat frequent meals every few hours, which is the case for many on low-fat diets. Calorie restriction is therefore easier and weight loss happens with much less effort." He also points out that some research studies have found that a ketogenic diet has benefits for individuals with type 2 diabetes and prediabetes. The ketogenic diet is popular because it works, at least in the short term. Just as Paleo books, cookbooks, and blog posts have flooded the market, today keto is picking up speed. A quick search on Amazon turns up beautifully photographed ketogenic diet cookbooks, along with urine test strips and food products including ketogenic cocoa and ketogenic cookies. Meal delivery services—a trend in itself—are increasingly offering ketogenic meal options. "People are getting into the hype of it," Ayesta says. "There are 'cults' in a certain sense that I'm not a fan of and not supportive of." Although he rarely suggests the ketogenic diet to clients, if they come to him wanting to try the diet, Ayesta first does a full nutrition assessment. This includes evaluating any comorbidities that might indicate the ketogenic diet isn't safe for them, such as individuals who are pregnant—there's a lack of research on the ketogenic diet during pregnancy—or have fat malabsorption. He also makes it clear that the ketogenic diet isn't the only way to lose weight. "I let them make the decision about whether to go on the diet," he says. "If they say yes, then I go into the education on how to correctly follow the diet." When one of his clients does choose to do a ketogenic diet, Ayesta insists on seeing them weekly so he can monitor ketone levels, energy levels, and cognitive function. He says that when someone says they're doing the ketogenic diet, and they're doing it on their own or maybe seeing a coach once a month, they're probably not doing it correctly. "We commit to three months to give it a chance to work," he says, in part because he finds it takes at least a month to settle into the diet. "Many people do two to three weeks on their own, and give up because they feel like crap, or it's not formulated well, or they didn't give it time to work." One frequent side effect when someone starts a ketogenic diet is the "keto flu," which can include lightheadedness, fatigue, headaches, nausea, and constipation. This is the result of the body's rapid excretion of sodium and fluids as carbohydrates are restricted. Increasing sodium by 1 g to 2 g per day may restore the body's levels to normal. Volek agrees that many people who attempt to do a ketogenic diet on their own are missing the mark. "This is why it is important to measure ketones, preferably from a finger stick using a device that quantifies beta-hydroxybutyrate," Volek says. "People vary in terms of the level of carbohydrate and protein intake that is compatible with ketosis. Thus, regular ketone measurements provide valuable feedback to personalize the diet." With clients, Ayesta often uses 70% calories from fat and about 20% from protein sources. "It depends on the situation of the person. In a client doing resistance training, I may push protein up a little higher. When I do that, I start monitoring ketone levels." He has his patients use ketone monitors and modifies macronutrients as needed. "Ketone levels are very individualized. What you're measuring is the level of ketones you have at any given time in your blood. What you can't measure is how you're using ketones inside of your cells." Reid says that the average person doesn't fully understand what ketosis really means, or that it's necessary to measure blood levels of ketones. "The mere presence of a few ketones doesn't make one in ketosis. And peeing on a stick isn't the way to measure blood levels of ketones, because simply spilling a few ketones in urine isn't indicative of ketosis," she says. "After all, we all produce ketones after a certain period of not eating. That doesn't mean that our body is magically shifting gears and the ketones are changing how we're oxidizing all the food in our bodies." One concern voiced in some studies is loss of muscle tissue beyond what might be expected from any calorie-restricted weight loss diet, possibly because the body is attempting to break down protein to create glucose, but Volek says this isn't an issue when the ketogenic diet is followed correctly. "If people do not understand the principles of a well-formulated ketogenic diet, such as the need for adequate—but not too low—protein and additional sodium and mineral nutriture, then there could be side effects, which may include loss of muscle tissue associated with a stress response," he says. "This does not happen when protein is adequate and minerals are consumed as part of a balanced ketogenic diet. Adding weight training to a ketogenic diet can help build additional muscle." Could the ketogenic diet's extreme restriction of carbohydrates contribute to micronutrient deficiencies and impact gut health? Ketogenic diets don't just eliminate sugar and refined carbohydrates; they also curtail pulses, whole grains, fruit, and starchy vegetables. All of these foods contribute vitamins, minerals, antioxidants, phytochemicals, and fiber—including prebiotic fiber that promotes a healthy gut microbiota. Numerous studies have demonstrated that the ketogenic diet alters the gut microbiota in ways that have benefit for reduction of epileptic seizures,15 but research is lacking on the impact in populations using the diet for weight loss or diabetes management. "B vitamins that are typically found in beans and grains can be of particular concern," says Somerville, Massachusetts-based Jessi Haggerty, RDN. "However, those who follow a ketogenic diet are more likely to have other deficiencies because the variety of food they're allowed to eat on this diet is so limited." She also points out that when people on a ketogenic diet are consuming large quantities of nonstarchy vegetables, the excessive amounts of insoluble fiber also can lead to nutrient malabsorption. Although there are a few exceptions, nonstarchy vegetables aren't rich sources of fermentable, prebiotic fiber. "We know that fiber is critical to serve as food for the gut bacteria and for the production of butyrate and other short-chain fatty acids," Reid says. "And, of course, SCFAs are important for immune function, controlling inflammation, and overall gut health. And we also know how important the gut is to the brain and vice versa in terms of anxiety, depression, and pain management. I feel like the keto folks are missing a huge piece of this puzzle." And what about saturated fats—is the ketogenic diet really the "bacon and butter" diet? As with any dietary pattern, the fats don't have to be animal fats. A 2004 study found that a ketogenic diet high in polyunsaturated fats was superior to a saturated fat–rich ketogenic diet by several measures.16 Getting more plant-based fats from avocados, nuts, seeds, coconut, and olive oil will supply more micronutrients as well as heart-healthy fatty acids. One safety concern about this diet is nondiabetic ketoacidosis. While this condition is rarely caused by low-carbohydrate diets, patients with comorbid conditions who experience an illness—such as the seasonal flu—or other stressors while following the ketogenic diet are at higher risk.17 In addition, Haggerty says the rigidity of the ketogenic diet easily can become obsessive and lead to disordered eating behaviors. "Many clients have tried the ketogenic diet for 'health' reasons and started working with me when the diet started to feel disordered. Clients suffered from constipation, amenorrhea, confusion and memory loss, and loss of focus, to name a few." "The ketogenic diet improves almost all known biomarkers of disease risk, but what has not been demonstrated directly in humans is whether it reduces cardiovascular events or other hard outcomes and extends life," Volek says. Ayesta says that while research on long-term effects of the ketogenic diet currently are lacking, longer-term research studies are in progress. "Studying the ketogenic diet for a long time is more difficult than many diets because it's more extreme," he says. "I think the premise is there, but there's more research that needs to be done. Time will tell." "It's just a tool in the toolbox that some people can implement," Ayesta says. "Some people like how they feel and like how they eat when they're on a ketogenic diet. If it works for you, great. The diet that works for you is the one you feel good about." So, if someone chooses the ketogenic diet, should they approach it with the intention of following it long term? "For most people, it's advised not to cycle back and forth, especially in those with insulin resistance, who will find it harder to get back into ketosis," Volek says. Because the diet can have health benefits for some individuals, Ayesta thinks training and certification should be options for dietitians. "The truth and reality is that a lot of people are interested in this, so we might as well get educated in how to follow this safely and effectively without compromising their health," he says. "People need the help of a professional, not only for accountability but also to make sure they're not hurting themselves." — Carrie Dennett, MPH, RDN, CD, is the nutrition columnist for The Seattle Times, owner of Nutrition By Carrie, and author of Healthy For Your Life: A Holistic Guide to Optimal Wellness. 1. Abbasi J. Interest in the ketogenic diet grows for weight loss and type 2 diabetes. JAMA. 2018;319(3):215-217. 2. Brouns F. Overweight and diabetes prevention: is a low-carbohydrate — high-fat diet recommendable? Eur J Nutr. 2018;57(4):1301-1312. 3. Tinsley GM, Willoughby DS. Fat-free mass changes during ketogenic diets and the potential role of resistance training. Int J Sport Nutr Exerc Metab. 2016;26(1):78-92. 4. Paoli A. Ketogenic diet for obesity: friend or foe? Int J Environ Res Public Health. 2014;11(2):2092-2107. 5. Zilberter T and Zilberter Y. Ketogenic ratio determines metabolic effects of macronutrients and prevents interpretive bias. Front Nutr. 2018;5:75. 6. Gomez-Arbelaez D, Bellido D, Castro AI, et al. Body composition changes after very-low-calorie ketogenic diet in obesity evaluated by 3 standardized methods. J Clin Endocrinol Metab. 2017;102(2):488-498. 7. Cicero AF, Benelli M, Brancaleoni M, Dainelli G, Merlini D, Negri R. Middle and long-term impact of a very low-carbohydrate ketogenic diet on cardiometabolic factors: a multi-center, cross-sectional, clinical study. High Blood Press Cardiovasc Prev. 2015;22(4):389-394. 8. Johnston CS, Tjonn SL, Swan PD, White A, Hutchins H, Sears B. Ketogenic low-carbohydrate diets have no metabolic advantage over nonketogenic low-carbohydrate diets. Am J Clin Nutr. 2006;83(5):1055-1061. 9. Paoli A, Bosco G, Camporesi EM, Mangar D. Ketosis, ketogenic diet and food intake control: a complex relationship. Front Psychol. 2015;2;6:27. 10. Sumithran P, Prendergast LA, Delbridge E, et al. Ketosis and appetite-mediating nutrients and hormones after weight loss. Eur J Clin Nutr. 2013;67(7):759-764. 11. Gibson AA, Seimon RV, Lee CM, et al. Do ketogenic diets really suppress appetite? A systematic review and meta-analysis. Obes Rev. 2015;16(1):64-76. 12. Saslow LR, Daubenmier JJ, Moskowitz JT, et al. Twelve-month outcomes of a randomized trial of moderate-carbohydrate versus very low-carbohydrate diet in overweight adults with type 2 diabetes mellitus or prediabetes. Nutr Diabetes. 2017;7(12):304. 13. Kosinski C and Jornayvaz FR. Effects of ketogenic diets on cardiovascular risk factors: evidence from animal and human studies. Nutrients. 2017;9(5). 14. Volek JS, Sharman MJ, Forsythe CE. Modification of lipoproteins by very low-carbohydrate diets. J Nutr. 2005;135-1339-1342. 15. Olson CA, Vuong HE, Yano JM, Liang QY, Nusbaum DJ, Hsiao EY. The gut microbiota mediates the anti-seizure effects of the ketogenic diet. Cell. 2018;174(2):497. 16. Fuehrlein BS, Rutenberg MS, Silver JN et al. Differential metabolic effects of saturated versus polyunsaturated fats in ketogenic diets. J Clin Endocrinol Metab. 2004;89(4):1641-1645. 17. Ullah W, Hamid M, Mohammad Ammar Abdullah H, Ur Rashid M, Inayat F. Another "D" in MUDPILES? A review of diet-associated nondiabetic ketoacidosis. J Investig Med High Impact Case Rep. 2018;6:2324709618796261. 18. Gardner CD, Trepanowski JF, Del Gobbo LC, et al. Effect of low-fat vs low-carbohydrate diet on 12-month weight loss in overweight adults and the association with genotype pattern or insulin secretion: The DIETFITS Randomized Clinical Trial. JAMA. 2018;319(7):667-679.